You’re on the right site. I went Low Carb on you today. I know you’re all scratching your heads thinking you hit the wrong button. But it’s me! See! Not only Low Carb but so full of flavour it will blow your mind. My friend Mellissa from I Breathe… I’m Hungry… asked me to guest post for her. Not only guest post but I have the distinct honour of being her first guest post. I could not be more thrilled and touched that Mellissa trusted me to do this for her. I am not typically known for healthy or low carb food. I’m sort of the anti low carb blog. But I love a challenge and was really intrigued to see if I could do this. It’s really opened my eyes to how difficult it is to develop great recipes for special diets. I give people credit who follow a low carb lifestyle for either health or weight reasons. It’s so much harder to come up with recipes without that go to sugar ingredient. I met Mellz, I love to call her that just to drive her mad, through food blogging. I really cannot remember how we connected initially. We were reading each other’s blogs and I think we were both drawn to each other’s sense of humour. I sent Mellz an email and she won my heart with her sincere personality and snarky wit. I love a gal who can out-snark me. Every email I get from her has me rolling on the floor in fits in laughter. She is so sharp and so funny. She pulls off one-liners with ease. And the chick can cook. And bake. Like mad skillz people. This woman is going to end up on tv one day, mark my words. Of course I’ll want a cut of the action, cuz you know, that’s what besties do when one of them hits the big time. And they shoe shop. Which I’m totally down for just so you know Mellz. Manolo’s here we come! 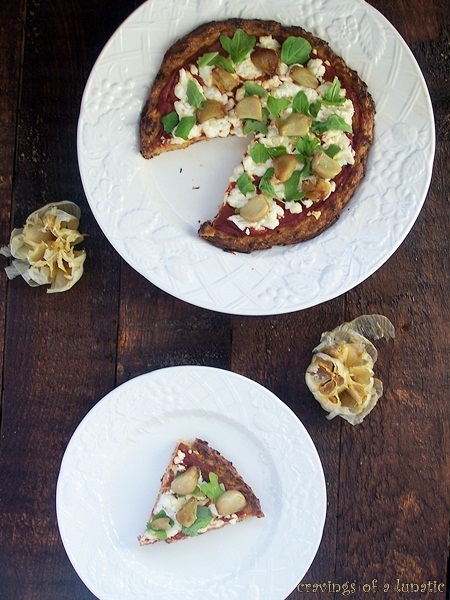 So head on over to my bestie’s blog I Breathe… I’m Hungry… for the recipe to my Roasted Cauliflower Pizza with Baby Arugula and Roasted Garlic. It sounds really complicated but it’s not. It is however delish. Even if you are not following a low carb diet this pizza will impress you. It’s got such a rich, sweet taste to it. The roasted cauliflower just takes the crust to the next level. And the roasted garlic on top is pure heaven. I sure hope you all like this recipe. I wanted to do Mellz proud and show I can do more than just sugar laden, deep-fried food. I sincerely hope I’ve met the challenge today. Thanks to Mellz for her continued friendship and making me push my boundaries to explore something outside the norm. I loves ya sistah! Holy cow that looks good!! I’ve never had cauliflower on a pizza before but now I need to try it. I’ll be heading right over to check out the post. Yum! It is really good. You actually use the cauliflower as the crust. Totally weird I know but so yummy. As a LCer I’ve seen lots of recipes for cauliflower pizza crust, but that was just a good idea to use roasted cauliflower! Plus I’m loving roasted cauliflower right now so this is perfect. Thanks for sharing! Thank you so much. I wanted to give it an extra kick with a touch of sweetness to it. Roasting it just elevates the taste. I swear it tastes like candy. So glad you stopped by. I’ve done the cauliflower pizza crust before (not with roasted cauli tho), and it’s good but definitely doesn’t taste like regular crust. Pairing it with roasted garlic (I looooooove roasted garlic) sounds like a great combo. Yum! 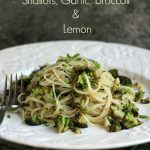 It is not the same but such a good alternative to anyone low carb or gluten free. Pizza is something many people complain about giving up. So I knew I had to come up with something with a bit of oomph to it. I love roasted everything. It just makes the flavour pop. It looks so delish! And I can’t wait to head over there! OMG Im loving this!!! I wish I was having this for dinner tonight. Going to check out the recipe now, cannot wait to try it!! Thanks so much Katie. I really had fun stepping outside my normal fare today. This is something I could eat every week. Thanks so much. It is a great way for low carb folks to still get pizza. Would be really good with prosciutto as well. Love arugula, love pizza and LOOOOOVE roasted garlic. Kim, I think this one is a winner. Thanks so much Dara. I really loved this one. You know me and sweet, so I was determined to find a way to make it slightly sweet without sugar. Roasted cauliflower (and garlic) is great on anything! Heading over to read the guest post now . . . Thanks. I could eat roasted veggies every day and never get tired of them. So interesting…cauliflower pizza, but from the list of ingredients…arugula and roasted garlic, must taste delicious Kim! Thanks so much Juliana. It’s such an interesting way to do it. 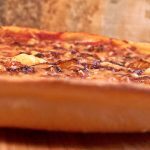 I really wanted to find a way to make pizza for people who can’t do gluten and then make it low carb as well. I am a sweets gal so this seemed the way to add the sweet without actually adding sugar. I’m so glad you came by. Have a wonderful week too. What a beautiful looking pizza! Thanks Lauren. It was really good. Lol, it is good stuff. I love me some pizza. Thanks Tina. I wasn’t sure I had it in me but I managed to make it happen. Lol. Those garlic pieces look oh so good. I am drooling. Did you have a turtle brownie for dessert? Thanks. Oh man, I made extra roasted garlic when I did it. I could just gnaw on roasted garlic all day long. But of course. Bah, see I’m thinking ahead. Always looking out for you! I can’t get enough of roasted cauliflower! This is genius! Thank you so much. I am a huge fan of roasted garlic. Just takes the pizza to the next level. 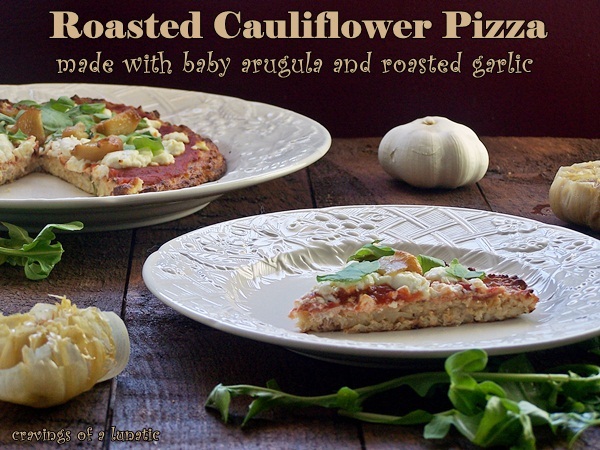 I’ve never had cauliflower on pizza before, but this looks awesome! Thanks. I think the cauliflower makes a great pizza crust. I love it with wild rice too. Just something a little different from the usual. Healthy food? Don’t let it happen again! LOL! Lol, I had to sneak one in there. Every now and again I get a hankering for something good for me. Not often but it happens once in awhile. I promise I’ll make up for it. 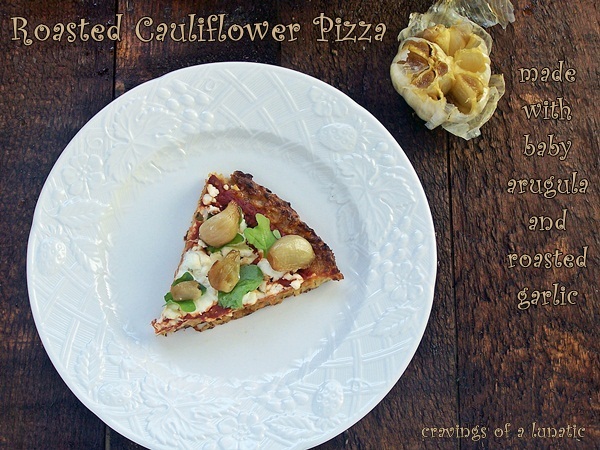 I’ve never tried cauliflower on pizza before but it does sound like a brilliant idea. It’s a cool way to make the crust if you’re low carb-ing or GF. Just a fun twist to pizza. Wait, where are the Rolos? 😉 I better go over and check this out. Maybe they’re under the cheese? Lol, I’ll have to make a Rolo Pizza just to make up for this I suppose. Oh boy, low carb and all. This does sound delicious and the arugala and roasted garlic there on the top is calling my name. Going to check out the recipe. It was really good. I love the taste of roasted cauliflower so I figured it would work well with pizza. 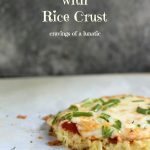 Been seeing this cauliflower crust o blogs for a month or so now, I just need to make it! Your version sounds absolutely terrific. Going to visit Mellz for the recipe. It’s such a cool idea. Try roasting the cauliflower first. I swear it makes all the difference. Mellz is one cool chick. You’ll love her. 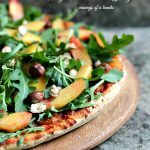 I came to cauliflower late in life and am loving this pizza – roasting cauliflower just makes it sing and I adore the spice in arugula! Great combo! Me too Claudia. Now I love it. Thanks so much for your kind words and for visiting. Kim, this is perfection–healthy and vegetarian to boot. Never would have thought to make a crust like this! I know right! 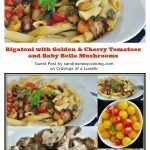 Healthy, low carb, gluten free and vegetarian. 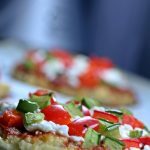 The cauliflower pizzas are definitely the way to go for anyone looking to healthy up a pizza. You use cauliflower for the pizza crust?! That’s unheard of! I’m so curious about the recipe now and will check the guest post now. Wow, this pizza looks DELICIOUS! Yeppers, it’s a cool idea. Just had to try it out. Really popular with the low carb folks. It’s neat cuz it’s also gluten free. Plus it just tastes amazing. What a deliciously different pizza. I’ve never heard of roasted cauliflower pizza, but it looks SO good! Even better it’s vegetarian and healthy! Definitely ticking all the boxes on this one. Thanks so much. It’s cool that it hits all the healthy marks- low carb, gf, and vegetarian. I was so happy with this one. I love this! I think I could actually eat that pizza. You could. And should! So good Trish, you will not believe how tasty it is. Way to step out of your comfort zone! 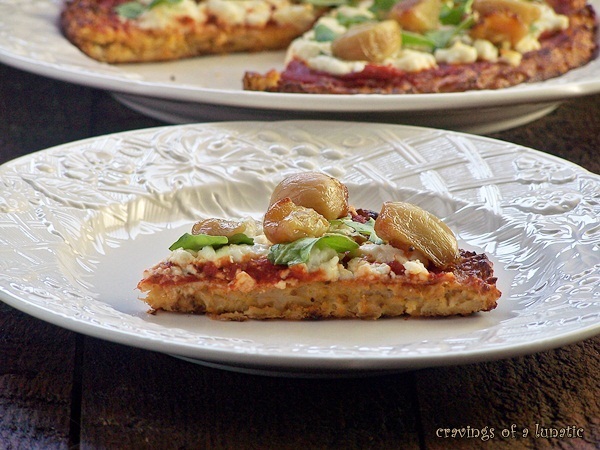 You know how much I want to marry cauliflower, so I love this crust! Thanks. I am pretty thrilled with how it turned out. Lol, then this is just for you Anna. Marry away. I eat pizza often but adding cauliflower and arugula to a pizza is new for me! 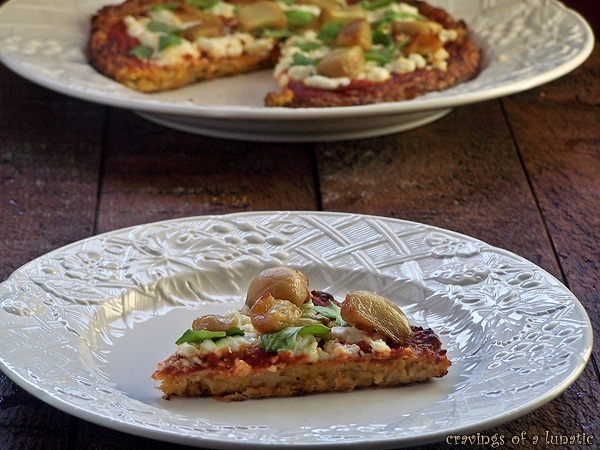 and best of all, it’s low carb… I don’t need to worry about eating more than one slice! It’s a cool concept to use the cauliflower as a crust. Such a neat way for low carb-ers to get their pizza fix. I like the idea of low carb but the reality is I do eat them. I would have trouble doing it all the time I think. But this was fun to challenge myself to do away with sugar and think outside the box. It makes a tasty crust, especially if you roast it first. I know right. I really don’t eat ice cream and cheesecake and krispies all the time. I must post way too many desserts cuz someone was surprised by my meatless monday post. I was like, er how long has it been since I posted pizza for someone to think that. Lol. I’ve been wanting to try cauliflower pizza crust! This looks tasty! You must try it Stephanie. It’s so good. I was really surprised I liked cuz I am such a traditionalist when it comes to pizza. We eat pizza a few times a week in some way, shape or form. Lol, it sounds all fancy shmancy but it’s really not. It’s so good. And good for you which is super fab. I love me some shoes…yet I find myself barefoot all the time. I just like looking at them and dreaming about them. But wearing them is a whole different story. Lol! I don’t do the low carb thing…but I do do the roasted cauliflower thing! Yummmm!!! !